Caydee died suddenly and there was no clear cause. We are never ready for this to happen and the path through grief is never easy but grieving for that pet is an important part of recovering. In reality, grief is our final expression of love, the last gift we have to offer. It isn’t to be rushed. Instead of trying to “get over it,” we must find ways to “get through it” — and that can take awhile. There is a love and sense of peace that comes from honoring the place our comfort pets have held in our lives. Caydee was a Cavelier King Charles spaniel and beloved first companion to Peggy Larkin. She completed her first obedience training course on 8/17/2004 and she earned her AKC CGC ON 10/1/2005 at age 2. Peggy was in the very first class that we conducted which began our wonderful organization in February of 2006. 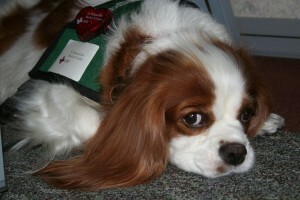 Caydee was just 21/2 then and this began her legacy as a Therapy and Service Dog Angel Ambassador. She had 2 litters that brought 4 additional therapy and service dogs to our family. Rudy, Annie, and Gus are all from Caydee’s line. Peggy and Caydee primarily visited Mountains Community Hospital and at VOE Elementary School participated in the R.E.A.D. Program. Caydee retired in 2008, but she is forever in our hearts and memory.